ironworks had the most liked content! The Jeep took most of the brunt of the tree. Too bad it doesn't have any trunk space left. . . 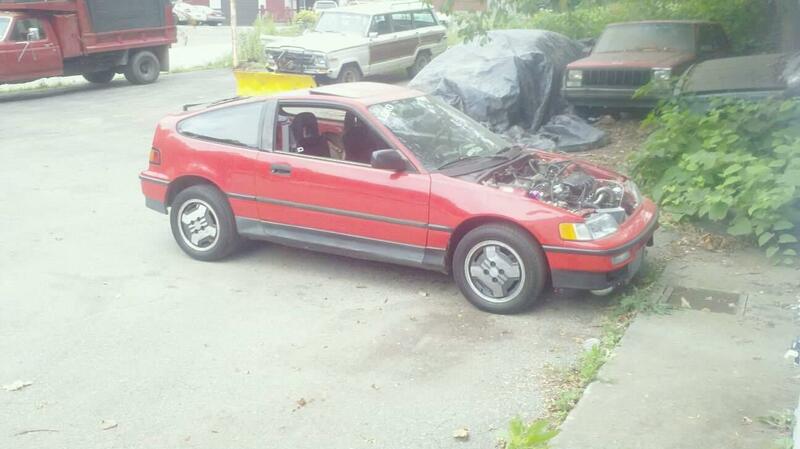 The CRX only has the door dent. Ill hammer it out and we will be good to go. we have had so much rain this year a tree on a hill side came down and hit the car. . . But I did get the B20 block ready for the new crank case vent. Im doing some much needed harness repair on our D16 back up motor. I have never liked the idea of running a chopped up drive shaft. . . I'm sure you could still have it balanced fine but I'd rather take the points and not be worried about it coming up through the floor. Working on my b20. I Have the block gutted next I'm taking it for a steam bath. That is sweet! I may have to steel that idea also. I have to agree. I still like the cell in the trunk away from the driver. Thats not his car but its a similar set up. then they have the cell boxed in on the inside. I think its a fantastic set up and would solve your problem altogether in a safe way. and mounting the tank lower will help with your handling of the car.